Chinese death rituals follow a rich cultural tradition dating back to the earliest dynasties. Chinese families still follow these traditions with a few small exceptions. It is believed that bad luck will plague the family of the deceased if the burial is done incorrectly. If someone dies and are unmarried, no respect is paid to them as they are not considered an elder, nor do they have children to prepare their funeral for them. They will be left at the funeral home and not brought home for a typical Chinese ritual. The parents are not even allowed to take the body home or offer prayers for them. The same is true for infants and children. No funeral rites are performed. The family members perform these burials in silence. 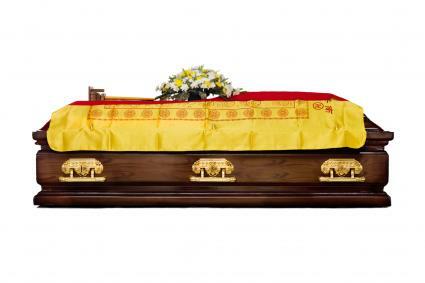 While some traditional Chinese death rituals use the rectangularly shaped casket with three humps, more modern Chinese use the Western-style caskets. Washed with care and dusted with talcum powder. Dressed in the very best clothes from their personal wardrobe. All other clothing must be burned. Dressed in black, blue or brown but never red as it is believed that this will cause the corpse to become a ghost. Placed on a mat. The face is covered with a yellow cloth. The body is covered with a blue cloth. Removing all mirrors from sight. According to Chinese beliefs, if you see a coffin in a mirror, you will have a death within your own family soon. Hanging a white cloth or banner over the door. Placing a gong outside of the door at the entrance. If a male has passed, the gong will be placed on the left side of the door. If a female has passed, the gong will be placed on the right side of the door. The color of clothes that are worn by family. Wearing black symbolizes the strongest sadness and should be worn by the spouse, children, and daughters-in-law. They are to wear a sackcloth hood as well. Sons-in-law wear white or something similar. Grandchildren wear blue and great-grandchildren wear light blue clothes. Attendees should wear dark, somber colors. No red and no jewelry. Flowers are acceptable at a Chinese funeral but the color is very important. Fresh-cut flowers are appreciated. Artificial flowers are also acceptable, especially if you are traveling a long distance. Lillies, irises, and chrysanthemums in white or yellow are traditionally considered to be funeral flowers in Chinese culture. Roses are acceptable but only in white. It is customary to give money as an offering to the deceased's family. It should be placed in a white envelope and handed to a family member or placed in a donation box. If the person has died at home, his or her coffin is placed on a stand within the home. If he or she died away from home, the coffin is placed on a stand within the home's courtyard. Wreaths, photos, and gifts are placed near the head of the deceased as it lays in wake. Food is placed in front of the coffin as an offering to them. During the wake, the person's comb is broken in two; one half is placed in the coffin and the other half is given to the family members. An altar is placed at the feet of the deceased person. A white candle is lit and incense is burned. 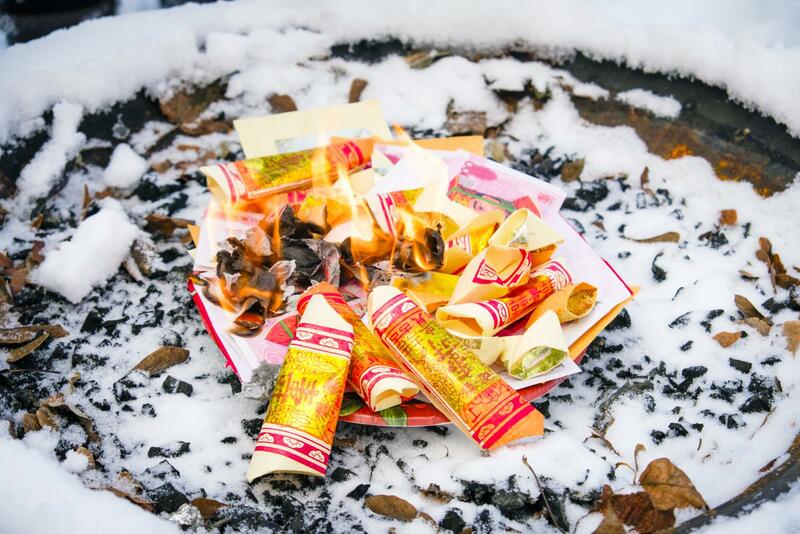 Joss paper and prayer money are continually burned throughout the wake to ensure the deceased person has plenty of money in the afterlife. Those attending the funeral are required to light incense, bow to the deceased and place money in a donation box to help defray the cost of the funeral. It is customary for family members and women to wail at Chinese wakes. The larger the fortune is left to the relatives, the louder the wailing. It is also customary for gambling to take place in the courtyards of the home. This is done to help family members stay alert during the wake and to take their minds off of the funeral. Taoist or Buddhist monks keep vigil over the deceased during the wake. They will chant verses of scripture for the deceased in order to help ease their journey into the afterlife. Music with a gong, flute or trumpet may be performed as well. After the wailing for the dead person has reached its highest crescendo, the coffin is nailed shut. White and yellow holy papers are pasted to the coffin. These papers will deter malign spirits from interfering with the deceased person. Everyone present does not watch this part of the Chinese death ritual as it is considered very unlucky. Pallbearers then remove the coffin from the house or courtyard with the head facing toward the road. The body is then placed at the side of the road where more holy papers are pasted upon the coffin and more prayers are said. The body is then placed in a slow-moving hearse. The eldest son, followed by the eldest family members, place their foreheads against the hearse and follow it. Chinese burials traditionally occur on hillsides because of their belief in feng shui. The higher the person is buried on the hillside, the better it is for them. Once the body is placed in the grave, family members toss handfuls of dirt upon the casket. After the coffin is covered, the cemetery keeper offers prayers. 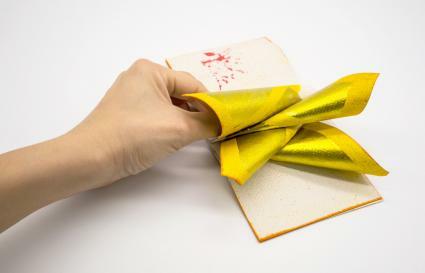 Family members are then presented with red packets that contain money that must be spent and white towels to wipe perspiration from their faces. The eldest son will keep a handful of dirt from the grave after the burial ceremony is complete. It will be used during worship ceremonies for the dead in the family home. It is believed that clipping the finger or toenails at night will cause a visit from the dead according to Chinese custom. If a dog howls continuously, it is believed that this predicts an imminent death. Dreaming of snow or teeth predicts the death of a parent. Before leaving to attend a funeral, some Chinese families leave a bowl of water infused with pomegranate to protect you from evil spirits following you home. Engaged couples or pregnant women should never attend funerals as it is said to invite misfortune. If you are engaged to be married and a close loved one passes away, you must postpone the wedding for one to three years. Red strings are given at a funeral to tie around your finger. This protects you from evil spirits that are among the dead. While the customs of some funeral rituals may be unfamiliar or even seem strange to us, they actually all have one common thread. Regardless of your culture, ethnicity, religion, etc., a funeral ritual is ultimately about honoring your loved one and paying them the respect that they deserve.